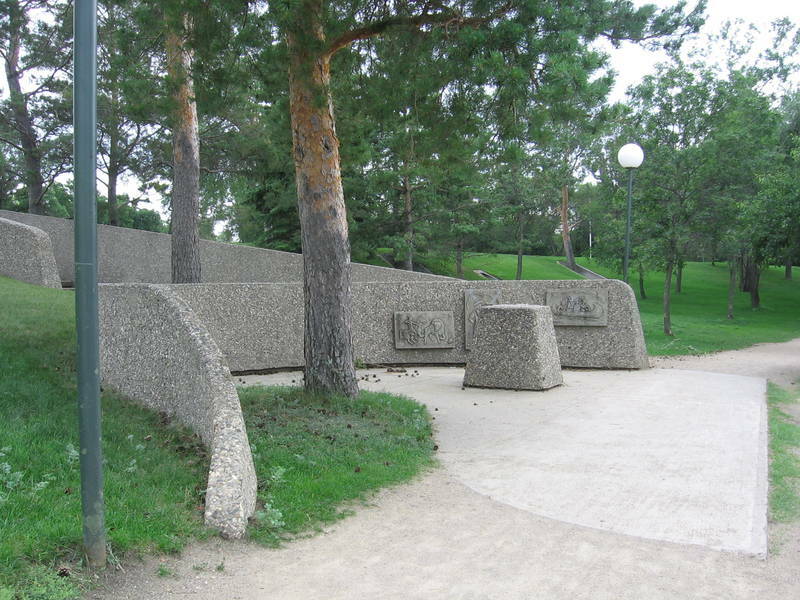 The Surveyors' Monument located north of Lakeshore Drive is dedicated to the surveyors of Canada and Saskatchewan whose skill and industry contributed greatly to the exploration, mapping, and development of our nation. 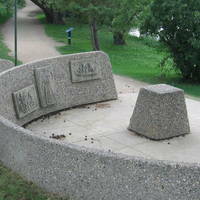 The monument was designed in 1967 by Jack Walker, Wascana Centre's Director of Maintenance and Development at the time. The Saskatchewan Land Surveyors Association proposed this project in recognition of Canada's Centennial. The Surveyors' Monument is a unique symbol dedicated to surveying in the past, present and future. The upper portion of the monument symbolizes and is, in fact, a surveyor's lookout. This site is the first station in a unified system of precisely co-ordinated survey points. There are eleven other survey monuments located across Canada, but this site is the control survey location for all of Saskatchewan. Along the stairwell of the monument are two plaques listing the members of the Saskatchewan Land Surveyors Association as of 1967 and 1985. The lower portion of the monument, a shelter close to the lakeshore, has been designed to represent the campsite that early surveyors and explorers would have made every night of their mapping expeditions. In the centre of this area is a cairn containing a time capsule which was sealed in 1967. The time capsule contains governmental reports, photographs of buildings, personal letters from Saskatchewan's 1967 Cabinet Ministers and former Premier Ross Thatcher, a 1967 license plate and telephone book, flags of Saskatchewan and Canada, and samples of wheat varieties, minerals and oil. Newspapers are also enclosed, including one article headlining the Saskatchewan Roughrider Grey Cup win in 1966. 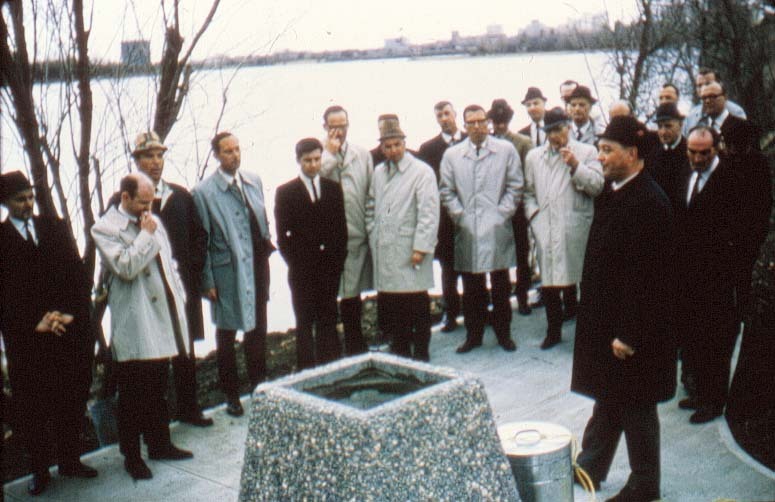 The time capsule will be opened on Canada's anniversary in the year 2067, 100 years after it was sealed. 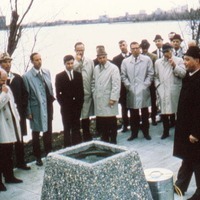 The cairn was dedicated on March 29, 1968. 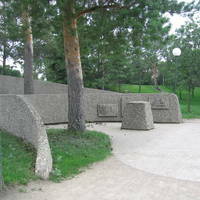 The three sandcastings on the lower wall of the monument also have historical significance. 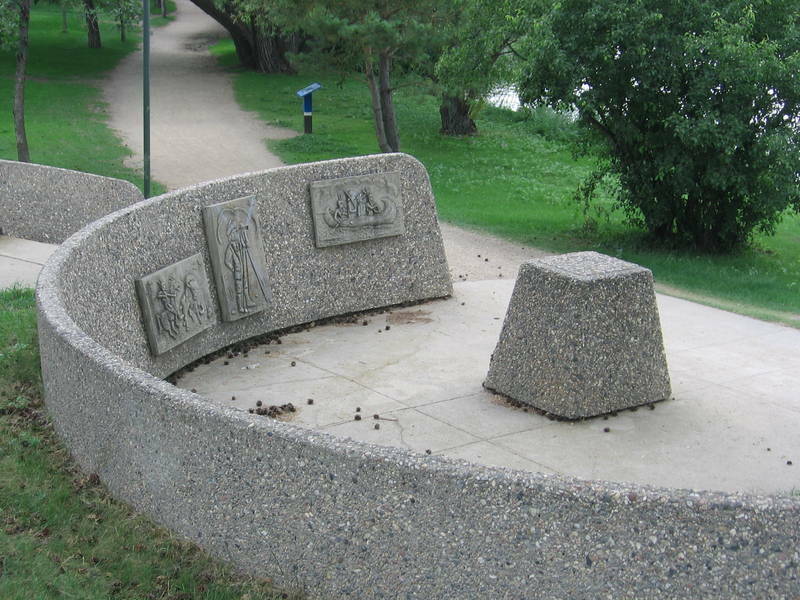 These three sandcastings were created In 1967 by Ernie Scheer, a long-time employee of Wascana Centre.